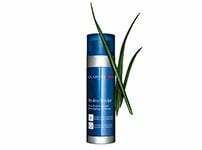 The anti-aging treatment enriched with 20+1 plant extracts that uses a hydrolipidic and biomimetic double formula to stimulate five vital functions: hydration, nutrition, oxygenation, regeneration and protection. This multi-tasking serum does it all! 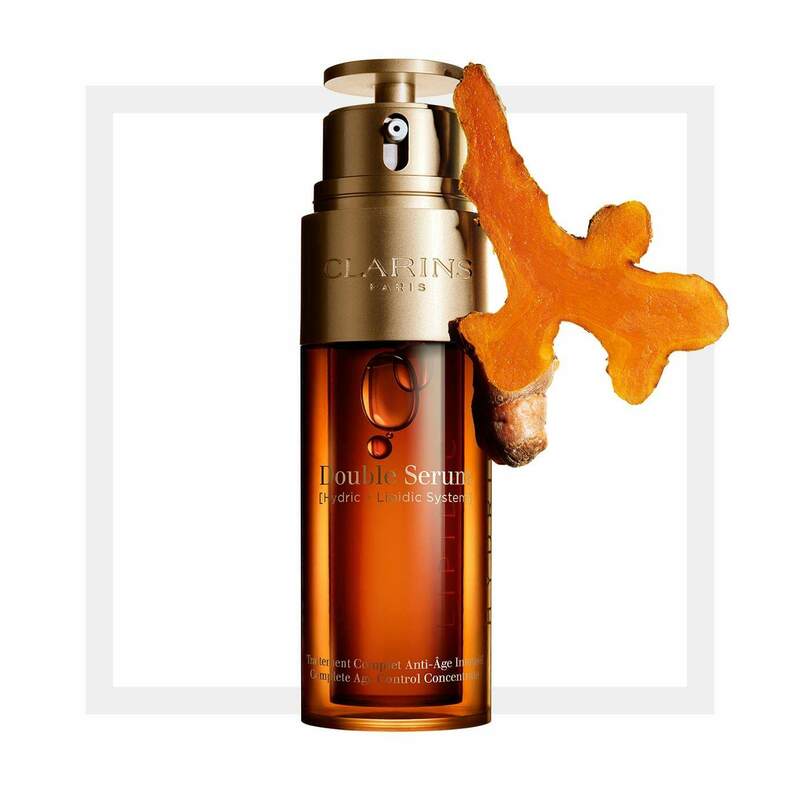 Clarins Double Serum acts on the appearance of major signs of skin-aging and contains 21 active plant extracts, including turmeric. Turmeric is renowned for its exceptional anti-aging properties. The bottle’s rotating push button delivers a made-to-measure dosage of serum. Skin is left looking more radiant, firmer, and fine lines are smoothed. Apply before your Clarins day or night cream for optimal anti-aging performance. 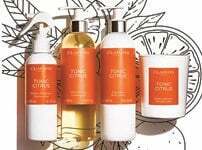 Rated 3 out of 5 by No time to waste from MIXING MY PRODUCTS Adore the product, it does what it says. However, the idea of mixing it myself does not impress me and infact just plain irritates me! Rushing around in the morning, twisting the cap this way and that and squirting is a definite no, no for me. Several times I have missed my palm with one squirt or another, or ended up with oily hands and dropped the bottle! I pay good money to purchase your products, I do not wish to be playing around with novelty toys that attempt to impress the product as special and must be blended by hand! One squirt would be perfect thanks. Rated 5 out of 5 by PrincessAli from Super serum! I received a seven-day trial of this product and I’ve been so impressed with the results. The serum smells lovely and my skin has noticeably improved in appearance and texture. I used it at night and loved the routine of putting it on before bed. Rated 5 out of 5 by GiselaD from Lovely texture! I live in London for just under 2 years and I feel my skin has worsened over the time. 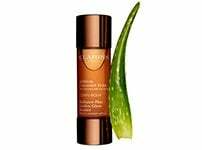 I have been using other brand serum and I did not feel any change in my skin tone or aspect. After reading many reviews I decided to give it a chance. I have used it every day in the morning and night as part of my skin ritual and I definitely feel how much my skin has improved in the tone as well as the appearance. Definitely worth trying it! Rated 2 out of 5 by Marina Blue from Shiny and greasy I have been trying to like new double serum really hard, but it doesn't work for me! I bought a two-bottle pack in yearly 2018 and started using it as soon as i finished the old style double serum and my skin became shiny and pores became visibly bigger! I initially thought that it might be because of hot summer weather and application of sun screen afterwards, so i had put it away for a while. I have restarted using it again in November and the problem remains: shiny, greasy and larger pores on the t-zone. I'm very disappointed as the old serum worked fine. And i still have a new bottle to go though. Any takers, lol? 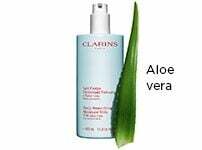 Rated 5 out of 5 by MG95 from Amazing product beautiful scent I purchased the clarins double serum recently after been a kiehls midnight recovery fan for just over 3 years & I have to say my skin as never felt so good! I do use other clarins products already but the double serum is new to me. I can’t believe how good my skin looks and feels! I absolutely love the double serum! Non sticky, non greasy, absorbed straight in! Perfect for both day and evening wear! I am in loveeee! Rated 5 out of 5 by Gemster123 from Amazing Wow love this. It soaks straight into the skin and leaves it super soft and glowing.